As a parent, I’ve found my smart phone to be a god-send. If it’s in the middle of the night, and my child is up for a feeding, I can check email or play a game so that I’m not “engaging” her when she should be eating and then falling back asleep. Or the light is great for when I can’t find her pacifier. Or the web app is ideal for 3:00 am searches if I can’t get back to sleep after she’s asleep because I’m wondering (worried?) about some development question. Or my children love the sound of Atlanta Nana’s voice, and I’ve been known to call her or play her voicemails over the Bluetooth in the car to soothe them while I drive. You can always tell when I’m on maternity leave by my Facebook activity, not just the endless pics of my cute kids but also how often I can be on. I tend to have a lot of “free time” at odd hours. There was a blog post not too long ago about “Texting While Parenting,” which noted the psychological and socio-emotional effects of using a smart phone while your child is awake instead of engaging them. This was followed up by numerous articles in October about the physical danger of smartphone use. Great—now parents need to add another reason to feel guilty or fear about their parenting skills? Then I remembered a Yom Kippur service years ago, before I was a parent to a 2-year old and 3-month old. The rabbi said something about “10% is showing up, 90% is being there.” (I didn’t write it all down, something about not writing on a High Holy Day…) And that makes sense to me. You can’t always be the perfect parent. And sometimes you need to put your screaming child in a safe place and walk away. But you can be present when you’re with them. Drop7, email, SongPop and Facebook can wait. Your children and mine should not. Instead of just saying children should honor their mother and father, let’s add Commandment 5 ½: honor your children. Think of it as a lasting Chanukah present. And don’t worry—I’ve never texted while driving or when my child is in the pool or bathtub. (Though I keep it on the bathroom counter because I always worry that something might happen, and I’ll need to call 911—I’m Jewish, I worry, it’s part of the deal). 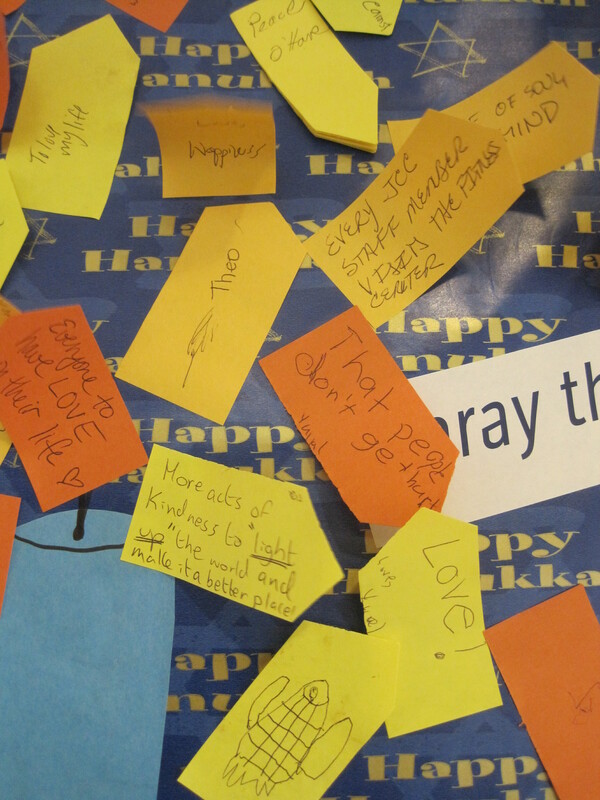 Our prayers range from lofty (“world peace”) to social-justice-inclined (“equality for all”) to personal (“have a baby”). Together, they make up a portrait of who we are. 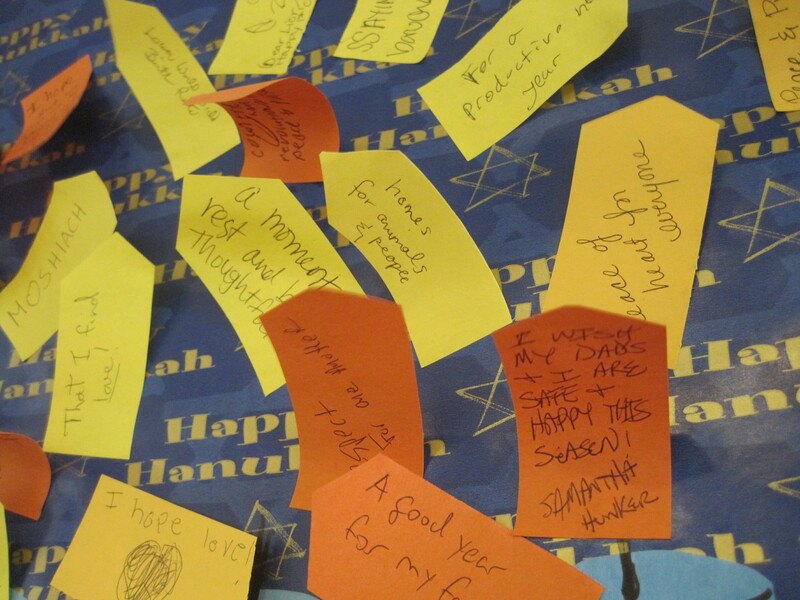 This week at the DCJCC, during every night of Chanukah, our community added our own prayers, hopes and wishes – lights for the season – a project that was kicked off by GLOE’s program on the first night: 8 Ways to Make Your Chanukah More Meaningful. 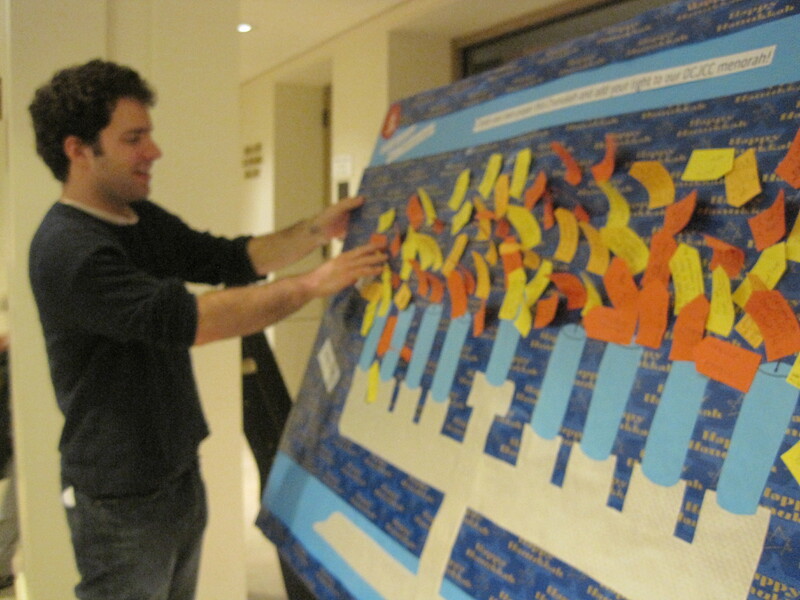 One of those ways was to consider, beyond the usual brachot, what do we want to consider? 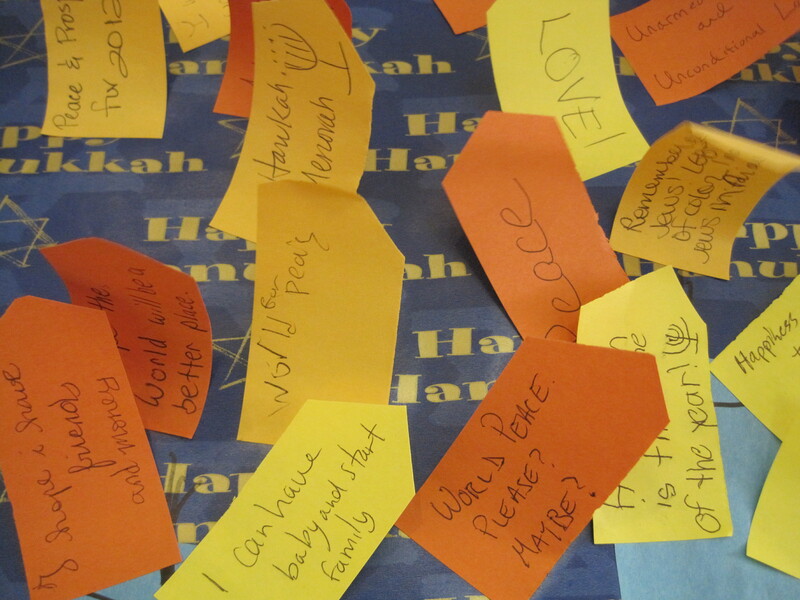 What hopes do we want to put out into the world? As a group, let us set our intentions, and work towards them in whatever way we can. In a happy accident, the display board was positioned under an air vent, so our flames actually flicker. 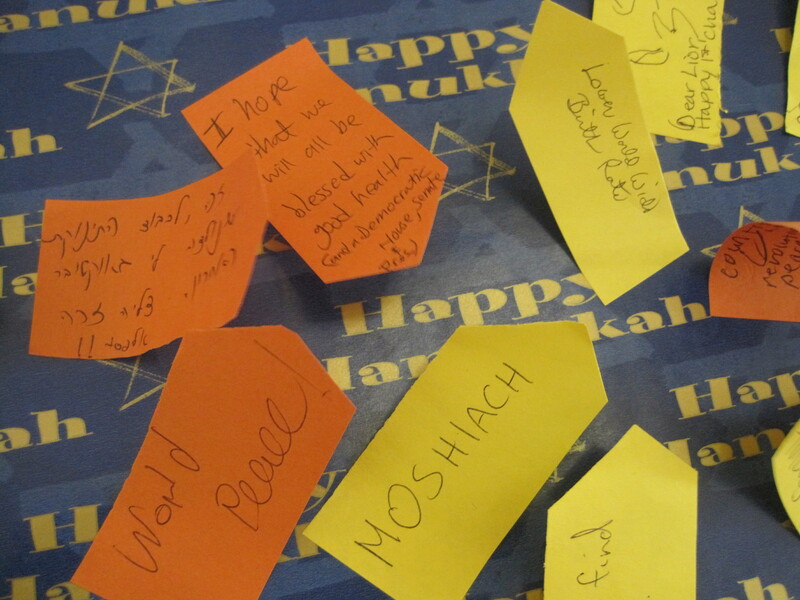 Throughout the week, I saw people drawn to the menorah, reading someone’s prayer for unity, a child’s hope for a turtle and that no one gets hurt, others’ hopes for the messiah, disarmament, political wins, food for the hungry, a job. I was drawn to one in particular: “Peace of heart for everyone.” I liked that it’s both lofty and pragmatic: we need to hope for the big things – peace, love, life – but in the unlikely event that all those big things don’t happen right away, let’s also find a way to be at peace with whatever’s happening now in our lives. Our lights will be on display in the lobby until the end of the week, and I hope you’ll come and read a few. Then, we’ll take down these little sticky notes, put the board away and collapse the easel it stands on. As for the “lights” themselves, they’ll flicker as long as we remain dedicated to whatever it was we hoped for and took the time to write out. It’s easy for Chanukah to fly by in a blur of wintry celebrations. We wanted to create ways that got at the spirit of the holiday and made celebrating Chanukah mean more than our usual routines. 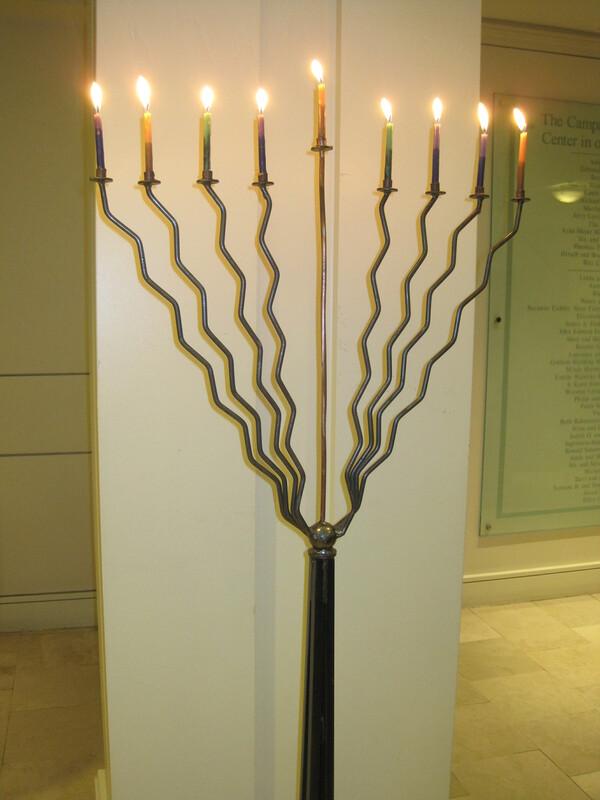 Remember what Chanukah is about: visibility! Not only put your menorah in the front window, but also talk to friends and family about issues that are important to you. Volunteer! Help at the DCJCC on December 25 or pick another organization that could use your help. 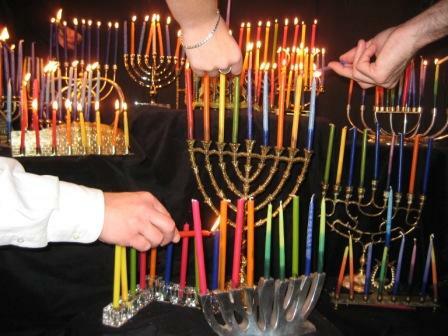 Remember what Chanukah is about: shedding light into the darkness! Reach out to a friend who could use your shoulder now. Make a donation to a nonprofit or charity in place of a regular gift, especially now when the tough economy has meant fewer donations. 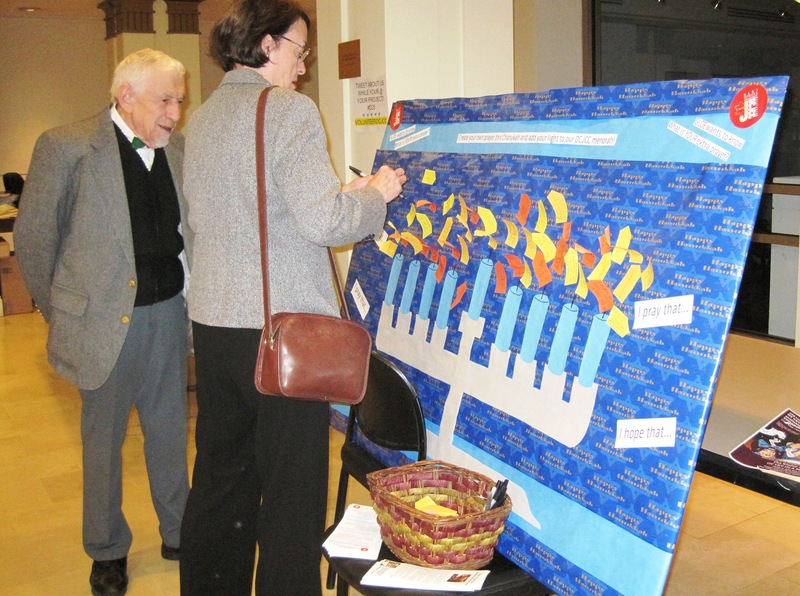 Remember what Chanukah is about: fighting back! Talk to your schools to see what they are doing about bullying and suicide, especially among LGBT youth. 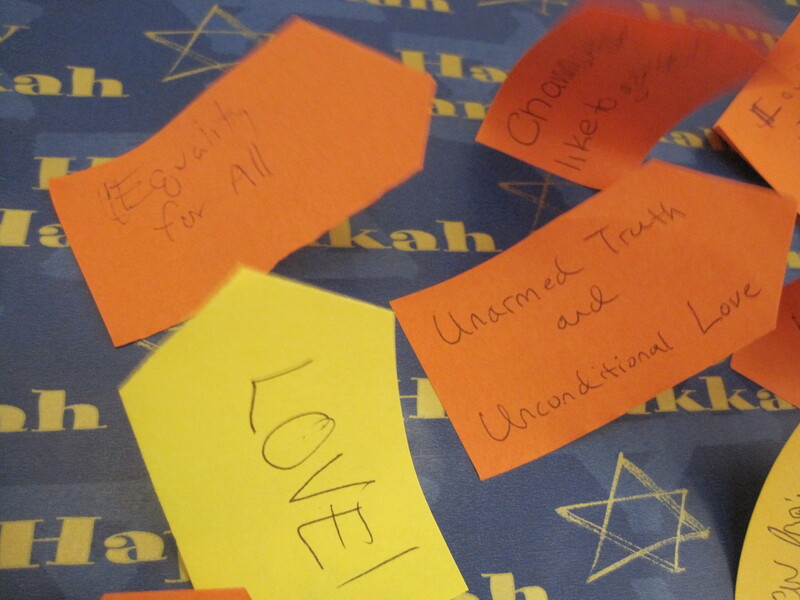 Tzedakah means justice! Think about ways you—yes, YOU!—can make the world a more equitable place… and then do them. 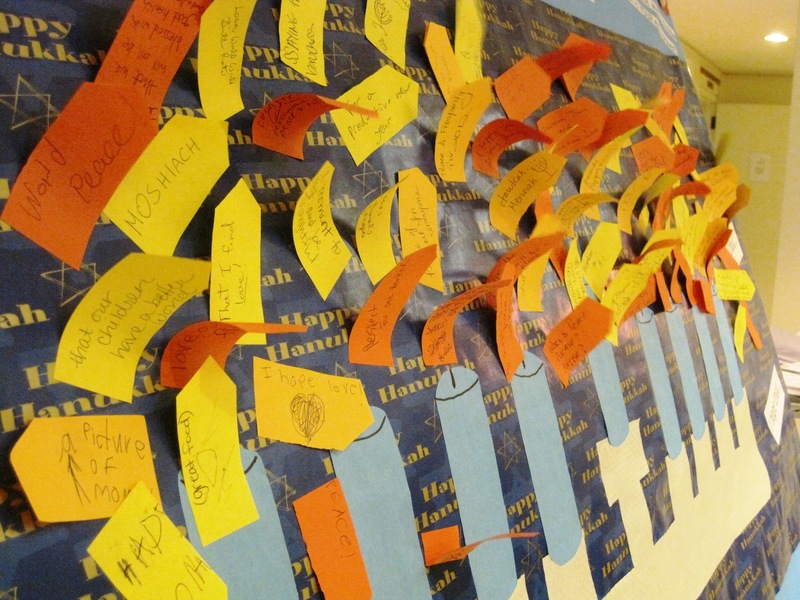 Learn a new Chanukah tradition from a group that celebrates differently than you! Create your own prayer! 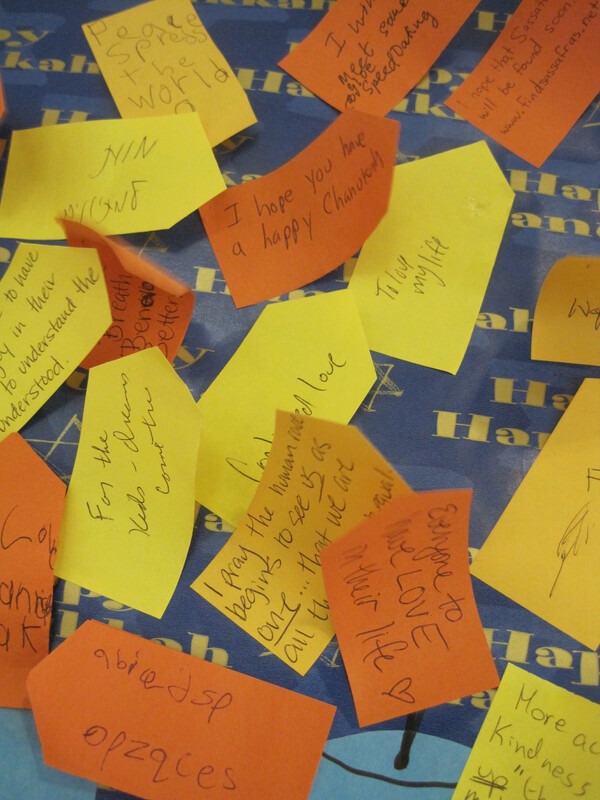 What does the holiday mean to you? What would you like to see change? What do you hope for? Stereo Sinai is a “Biblegum Pop” band that fuses traditional gospel, rock, and pop music with modern themes. 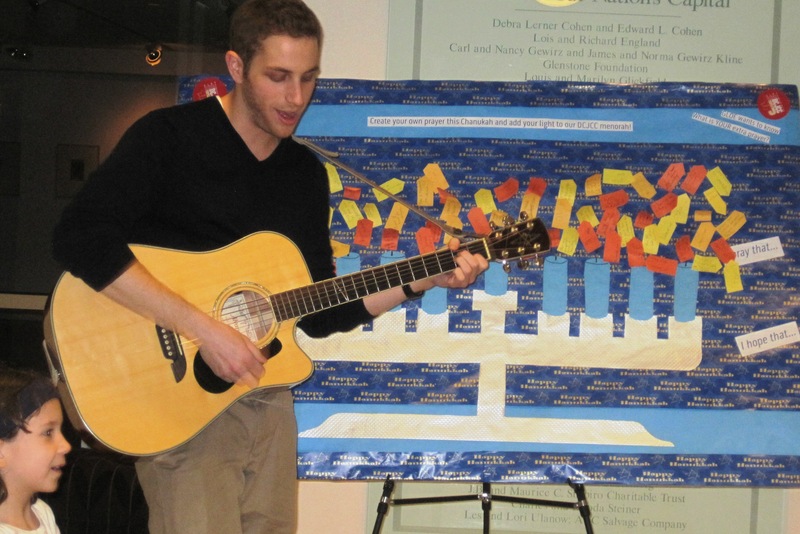 They created this fantastic re-imagining of the Hanukkah classic Mi Yimalel (Who Can Retell) for MyJewishLearning.com. You can even download a copy to keep! 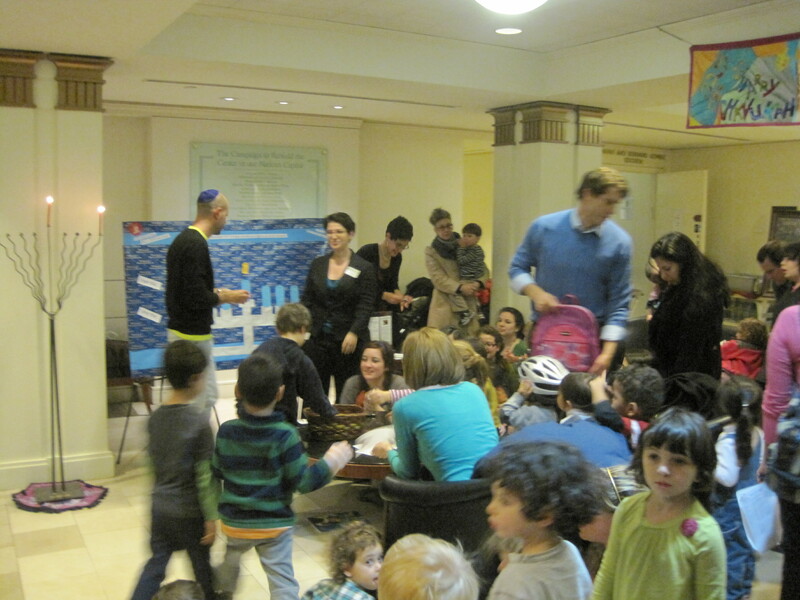 This is a video shot at the Jewish Club for Children and Youth Moadon in Warsaw. Amazingly, they’re dancing to an awesome version of the Ladino classic Ocho Kandelikas by the Hip-Hop Hoodios. So ever since we wrote this description for our Chanukah Carnival, I’ve had Adam Sandler’s “Chanukah Song” in my head. 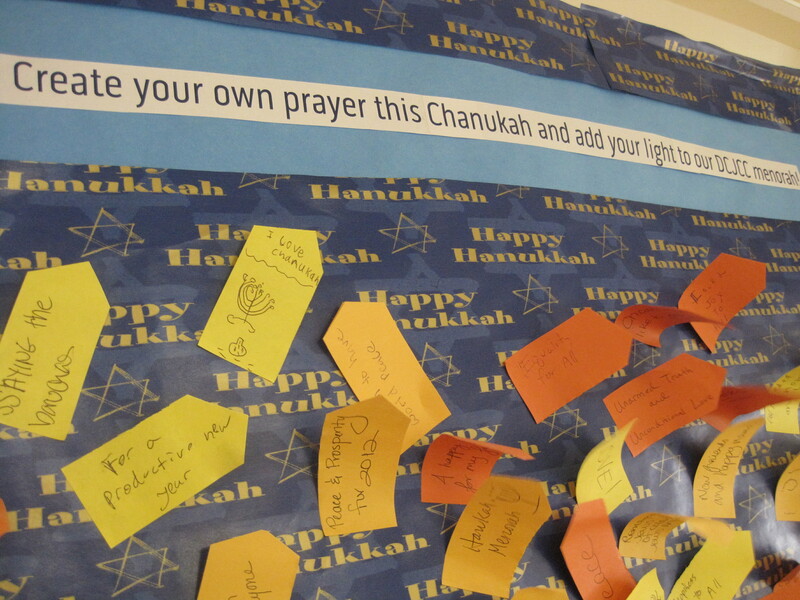 Grab your socks and your yarmulke, it’s time to bounce for Chanukah. This year’s rockin’ Chanukah party will feature a moon bounce, games, crafts, treats and plenty of fun for the whole family. So I suppose I’m stuck with this on my own until Chanukah actually starts on Tuesday, December 20. For eight nights after that, the rest of the Jewish population can join me. It’s a good song, no? And if you want to know what started it all, join us this Sunday morning—yarmulkes not required. This Bible Raps video is amazing, fun, hip and inspirational. A great way to kick off the Chanukah season. Enjoy!